One of my goals for this year was to finish more series. I had started this many years ago. The sad thing is why I started it is because I loved the cover of the third (and last) book. I did read this, but never finished the series. I decided to pick them up from audible and get through them. I am so glad I re-read/listened to this. I remembered a few details, but not many. I am regretting the audiobook decision a bit, since I don't love the narrator. His voice for two of the main characters is similar which makes it difficult to know whose head/voice I'm listening to. But I already have them so I will listen to them. 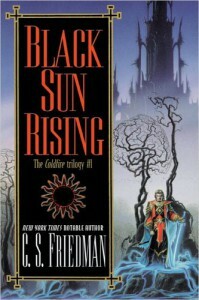 The Coldfire Trilogy is one of the best blends of science fiction and fantasy. Sometime in the future, humans left Earth and ended up colonizing a planet called Erna. Erna has fae which some humans are born being able to sense (adepts) and others learn how to become "sorcerors" who can "work" the fae for various purposes, such as healing. The society is fairly medieval with horses and boats being the main sources of transportation and crossbows and swords as weapons. Not much has been revealed about why they don't have advanced technology anymore. The Second Sacrifice is mentioned a few times, but not explained. Overall I liked the story, though the driving force for the plot involved a character I wasn't really into, but based on the ending I don't expect to see more of them. "He looked like a refugee from a garden party." "One by one they assented -- Senzei with vigor, Ciani with relief, Gerald Tarrant with...hell, did he ever look agreeable?" I do look forward to reading the rest of the series.